Chris - The Square Kilometre Array is soon to be the world's largest and most sensitive radio telescope. 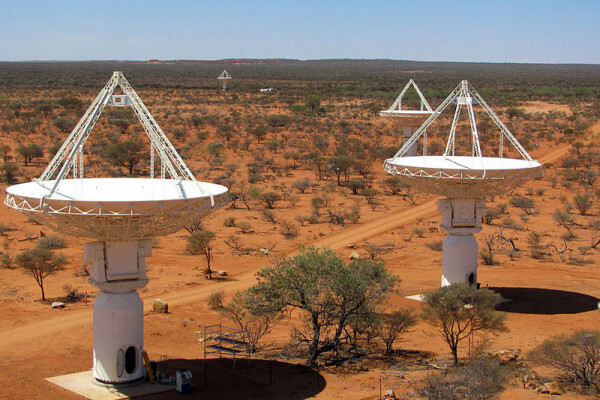 Located in a remote part of the Australian outback about 800 km north of Perth, two precursor instruments, the Murchison Radio-Astronomy Observatory and the Australian Square Kilometre Array Pathfinder have already been built on the site. Kirsten Gottschalk from the International Centre for Radio-Astronomy research set out on an expedition to see the site from Perth with some of the engineers who work there. Dominic - The Square Kilometre Array or SKA is an international project which will be split between Southern Africa and Australia. Centred around the Karoo Desert in South Africa, an array of radio dishes will be built which will stretch over distances of thousands of kilometres into neighbouring countries. In Australia meanwhile, the Murchison site will be at the centre of a second array of radio antennas, also spread over distances of thousands of kilometres which will utilise a new kind of radio receiver called aperture arrays. It's only in these remote and mostly uninhabited locations that radio astronomers can get away from the noise of mobile phones, Wi-Fi networks and television masts to be able to detect the faint radio signals that they're looking for. Together, the SKA's two arrays will form an instrument which will be around 10,000 times more sensitive than the current generation of radio telescopes and will allow images to be taken of the faintest and most distant galaxies ever observed. By looking at distant objects whose light has taken billions of years to cross the universe to reach us, it will be able to look back in time. The astronomers building the telescope hope that it will be able to look back so far in time that it will be able to see the first galaxies forming out of the smooth structureless sea of gas that was produced by the Big Bang. Kirsten - It's now about 2pm and we're still on the road. We just left Morawa where we had lunch by the side of the road. We're now driving along a very straight road with some beautiful blue skies ahead of us with some little wispy clouds around. It's about 30 degrees, and as we're heading further north, we're getting progressively warmer. The fields around us are nice and brown and dry, and we're about to be passed by a road train with some ore. The road here is actually only single lane tarmac so you have to go out onto the dirt to get passed and then all the dust comes in that's not as pleasant as it could be. A three carriage road train just passed us and now, another one's coming back in the other direction that has four carriages. These trucks are huge! Dominic - The SKA won't just be looking at very distant objects. Within our own Milky Way galaxy it will expect to discover thousands of pulsars, the fast rotating remnants of dead stars which emit beams of radio radiation from their magnetic pulse and appear as radio sources which pulse on and off on each revolution, often hundreds of times a second. If two of these objects can be found in close orbit around one another, the way in which they move in each other's intense gravitational field will allow the SKA to put Einstein's theory of general relativity to the test. Kirsten - So, we just tend onto the road into the Murchison Radio-Astronomy Observatory and we're driving along and we're going to get a glimpse of a telescope soon, I think, in the distance. I think as we round this corner, we might be able to see a dish. Oh, we see one. Kirsten - Up there on the left. It looks tiny from a distance, doesn't it? So, we've just pulled up to the gate. We're going to say hello to Martin, one of the MWA astronomers and engineers who's opening the gate for us. Thanks, Martin. Brian - You guys saw the Bungarra [large lizard] on the drive in but there's another one just a couple of hundred metres ahead near that net on the right hand side. Dominic - Though construction of the SKA is still 3 years away, the Murchison Radio-Astronomy Observatory is already home to two precursor telescopes. Australia's National Science Agency CSIRO is building the Australian Pathfinder - ASKAP for short - on the site. When it is completed, this will be an array of 36 radio dishes, each of which measures 12 metres across. Nearby, the Murchison Widefield Array or MWA is a much less conspicuous instrument. Rather than using dishes to reflect radio waves and focus them onto a receiver, it consists of tiny antennas, each measuring no more than a couple of feet across which are arranged in groups of 16 called tiles. So, we've just turned back onto the road that goes straight down the middle of the MRO. We've got a breakaway to our right. Again, the MWA site is to our right and to our left is ASKAP. We can't see any of it yet, but as we come up here and turn a bend, we should get a glimpse of the ASKAP core where there are about 11 or 12 of the 36 ASKAP dishes in a close area... They really do look small from a distance. It's not until you get close that you realise just how big they are. Kirsten - Yeah, it's absolutely amazing country out here. It's flat as a pancake apart from the breakaways, but there's little bushes everywhere and a few trees that are maybe person height, but most of it is just flat red dirt which of course makes it absolutely perfect for radio astronomy. We're now wondering around the core of ASKAP and this place is incredible. These dishes are massive and we were lucky enough that one of the CSIRO workers just let us inside one to have a look inside. There's so many cables and fibres, and digital chips. It's such an interesting contrast to the fact that we're 8 hours from anywhere pretty much. We're in the middle of a desert, in the middle of nowhere which of course is where we need to be to be doing this radio astronomy. I'm looking up at one of the ASKAP dishes now and this big, bright green checkerboard circle above the dish, and that is what we call the phased array feed. It's the brand new technology that CSIRO have invented and they are just absolutely incredible. We first been told they have 188 different feeds. So that means there's 188 different signals coming down off these dishes, allowing it to look at a broad section of sky. Usually, radio telescopes only have one or maybe a few of these things, but these dishes have 188 of them. Hopefully, it will feed into the Square Kilometre Array and beyond the Square Kilometre Array dishes. But at the moment, they're building them for ASKAP. Another really, really interesting thing about these dishes is that they don't just move up and down and left and right. They also spin around completely which sounds kind of trivial, but then you're going to think that there are hundreds of cables coming out of the top of this dish and then you have to spin it around 360 degrees. There's so much complex cable management inside these things. In fact, you go inside and it's all just big racks of computing that takes in the analogue signal and then more computers that turn into a digital signal and hundreds and hundreds of cables being managed so that they can twist around and not to get tangled or stop the dish from turning where it needs to turn. Previous How do you weigh an ocean?